I walked out to make breakfast on Valentine's Day morning and found the most beautiful string of light-up paper roses. I have to tell you that I broke down and cried when I saw what my sweet son, who lives with chronic pain, had made for me. He had them strung on my kitchen counter as a surprise. Here's a close-up of the rose. He made spirals and then painted them and put each rose around a string of lights. It's so pretty! I found a Rose Chintz teacup on Ebay for $3.00 and finally bought one. Don't we all think of Sandi at Rose Chintz Cottage when we see this pattern? I have been wanting one for so long and it just went perfectly with my string of paper rose lights. I'm thinking of stringing the lights somewhere in my bedroom to enjoy every night. Grease bottom and 1/2 inch up sides of a 9x9x2-inch or 8x8x2-inch baking pan; set aside. In a medium bowl combine the 2 cups flour, baking powder, and salt; set aside. In a medium mixing bowl beat shortening with an electric mixer on medium speed for 30 seconds. Add the 1/2 cup sugar. Beat on medium to high speed until light and fluffy. Add egg; beat well. Add flour mixture and milk alternately to beaten egg mixture, beating until smooth after each addition. Spoon batter into prepared pan. Sprinkle with raspberries. In another bowl combine the 1/2 cup flour, the 1/2 cup sugar, and cinnamon. Using a pastry blender, cut in butter until mixture resembles coarse crumbs; sprinkle over raspberries. Bake in a 350 degree F oven for 50 to 60 minutes or until golden. Serve warm. Makes 9 servings. Here's my BHG Cookbook that I've had since I was a new bride, back in 1970. It's tattered, worn, and the binding is taped together. I'm hoping that maybe one day a granddaughter will want it, and cherish it. Hi Kitty, The paper roses are lovely! Mike is so thoughtful. Hope and pray he is feeling better. The rasp buckle looks good. I have two of the plaid cookbooks - one from my wedding in 1976 and a newer one. I like the old one best! Your son is so creative, and obviously loves you immensely. Wow! He can have a side business going on. This dessert is so yummy looking. Glad you found that tea cup. How wonderful and thoughtful. I have that same cookbook but! my sweet little granddaughter found out how to open the pages and you know what happened next!! I still do not have the pages back where they belong. Kitty that is a fabulous gift that will be treasured. I Love the lights! And the teacup is everyone's favorite, isn't it?! Lovely photos and tasty goodies! Thanks so much for linking to Tuesday Cuppa Tea! Your son Mike is a dear young man for making you those paper roses! What a sweet surprise! I'm glad you got yourself the teacup. Three dollars isn't too bad for it. Your buckle looks delicious and would be lovely with a cup of tea. Wish I could join you, Kitty. Thanks for joining me for tea today and have a wonderful week, my friend. The paper roses are fabulous! 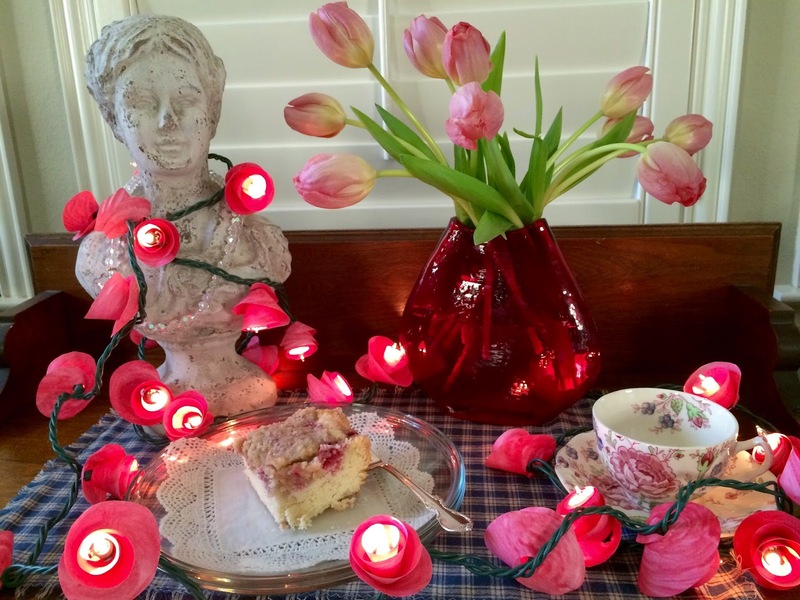 The rose chintz teacup is a great find--I love it when bloggers finding long-awaited items on their wish list! Kitty, The rose lights are such a thoughtful gesture from your son. The raspberry buckle looks delicious, The rose chintz cup was a real find. Have a great week. Very sweet of your son to surprise you with the rose lights, which are pretty. Yes, Rose Chintz says Sandi to me all right and the cookbook does look familiar. I imagine I could substitute raspberries in my own blueberry buckle recipe which has pecans in the streusel. Oh isn't your son the sweetheart? OH how tender and thoughtful of him to surprise you like that. Oh, Kitty, that is such a nice thing to wake to. I have tears in my eyes. Such pretty lights and such a sweet Valentine's Day gift! I have that same cookbook, and it's one of my favorites, a real classic. What a guy! For a man to create something like that is no small miracle! He had to have put a lot of time, thought, and love into this beautiful project! That took a lot of time to paint each of those roses and to make each of those spirals! He deserves a flurry of butterfly kisses and super hugs!!! What a sweet son you have! Aren't those the best gifts? Your buckle looks wonderful! Thank you for sharing. Your son is a darling. What a lovely garland of roses! The raspberry buckle looks so delicious. I copied a "buckle" recipe from the English Kitchen blog once but never made it. This sounds just wonderful. I am going to copy yours too. I have never seen a rose set of lights - totally original!! Hope you have a nice week. We got 6" of snow today after lots of 60-70 degree weather. Oh what a special gift of love, mom! Love the teacup...the recipe...the cookbook. We got our first at our wedding nearly 47 years ago...it's fallen apart but I was able to find a like-new one for $4 last year and am thrilled with it. Thanks much for sharing this lovely post with us at Weekend Potluck. Kitty, what a special surprise. I would have cried too! Happy you found a tea cup that you've wanted. It's beautiful! I have the same cookbook. 70s brides! What a sweet son! That was very touching. And thank you for the recipe! Going to print that one up and add it to my tea party binder! Hi Kitty, what a sweet thing for son to have done for his Mom! The lights are amazingly effective. Raspberry Buckle looks divine ~ I am definitely bookmarking your recipe. What a beautiful and thoughtful gift from your dear son! Just lovely, and you can continue to enjoy it long after the raspberry buckle is gone! Mmm . . . love raspberries too! Your new teacup is beautiful! Awe those are wonderful. That that raspberry buckle looks delicious. Kitty thanks for popping over to me ~ I left you a reply. Oh Kitty, your has a precious and big heart just like you :) How sweet and thoughtful of him to think of his dear mother - such a sweet gift, my friend! And may I say he is quite clever with the roses - they are simply beautiful! The two of you just made my day beautiful. Hugs to you, lovey lady! Well, isn't your son a sweetie! And that buckle looks yummy! Kitty, the rose lights are awesome! What a sweetheart of a son. Love the new teacup and what a great price. Yes, we think of Sandi. The buckle sounds yummy. I love raspberries, my fav fruit! Can you believe that I got rid of my original cookbook when it was getting worn years ago and bought a new one? What was I thinking? Well, I found an old one at a thrift recently. Thanks for sharing with SYC. The girls in our family have always received a "Red Check Book" when they moved out on their own. Now the guys also want them! What a great Son! What a sweetheart your son is! I am saving this recipe to try in the morning. I just sent the husband out to find the raspberries in the freezer. I have three of those cookbooks: one from 1941, one from 1964, and one from a few years ago. It is very interesting to compare! Everything on your table is beautiful, Kitty, especially those paper rose lights. What a great idea, and your son is a real sweetheart!! I'm thinking that was probably not a quick thing to make, either -- no wonder you cried. I have the "new" BHG cookbook, Kitty; it was a Christmas gift from my parents several years ago. It's a great one to have on hand. How thoughtful and kind not to mention, beautiful are the rose lights created by your son. A treasure for sure. The cake looks wonderful! I love raspberries and I have posted the blueberry buckle recipe on my blog. I never would have thought to try it with raspberries. Oh, Kitty, I DO so hope we can have tea some day!! 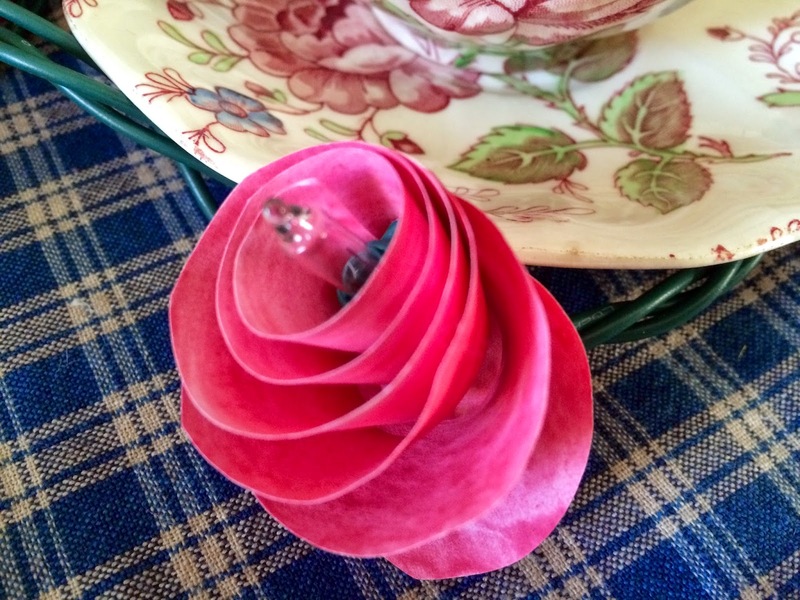 Thanks so much for your sweet comments about my SIL's gift of the violet tea/chocolate cups! I can certainly see why you cried when you saw your son's gift from his heart. That he would think of it even, let alone deliver on his thought/creation, especially for Valentine's Day, is such a magical and loving gift. I rejoice with you in his love for you. What a beautiful thing to do, your son is a credit to you Kitty. I adore the paper roses - I'm so impressed he made them himself - he is a creative talent! The Rose Chintz cup and saucer are lovely - only $3 what a great deal! This one has been on my list for a while too, along with some transfer ware. I can see I'll have to get on Ebay! Another yummy recipe thank you - we love raspberries in our house too! Oh my I would really enjoy a nice slice of your Raspberry Buckle today while we are iced in. I still have my cookbook just like yours, wow those were the days. Hope you are having a great week and thanks so much for sharing your post with Full Plate Thursday. That raspberry buckle looks scrumptious, and the roses and tea cups are beautiful! I have serious ENVY over that tea cup...and the buckle looks magnificent. Beautiful post. The apple didn't fall far from the tree! What a sweet gift from Mike. I hope he gets relief soon, how awful to live in pain like that! Prayers for him! See you next week?